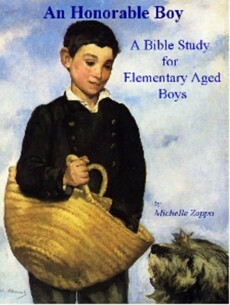 When my son was in second grade I ordered a workbook for his bible study, An Honorable Boy (A Bible Study for Elementary Aged Boys) by Michelle Zoppa. This 79-page workbook for boys ages 6-12 is broken up into 12 weeks covering various topics related to honor. 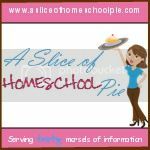 As it states in the book, "Your child will use biblical examples to move into more in depth study of the section's topic." It then ends the section with an art activity. Here's an example: Week 2's topic is, "An Honorable Boy Obeys and Listens to Instruction." This is followed by questions for the child to answer pertaining to the definition of obedience. The bible character chosen as an example of what it means to be obedient is Abraham. The child reads bible verses pertaining to Abraham and then answers the questions laid out in the workbook. It ends with an art activity in which the child is asked to draw a picture of Abraham. Although an older elementary child could do this study on his own, I enjoyed reading An Honorable Boy (A Bible Study for Elementary Aged Boys) with my son because it gave us an abundant amount of opportunities for some interesting discussions. This is one of those workbooks that a child can go back and read through again at any time throughout his elementary years.